Klio - A Top European Brand. Est. 1900, sold world wide. The TURNUS is a new and patented innovation that combines two of the most important promotional items in an intelligent and convenient way. Under the top part of this smartly designed pen a high quality USB-flash drive using the latest Micro COB Chip-technology is hidden. The brand new €˜Silk-Tech€™ refill ensures a velvety writing experience with up to 3000m writing capacity. 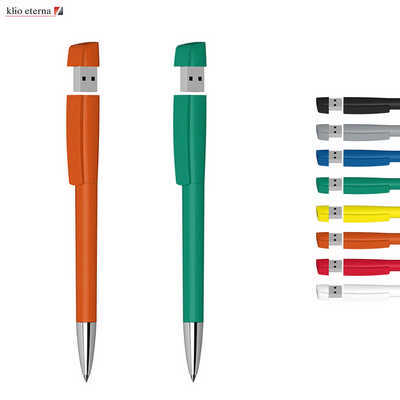 The huge variety of colours and finishes help make the TURNUS the perfect promotional item. Why TURNUS?. - Latest COB-Chip technology made by Samsung. - Klio-made plastic jumbo refill with tungsten-carbide-ball and 3000 metre writing capacity(Quality acc. to ISO 12757-2/Shelf life 3 years). - Plastic pens with silver metal tip. Variable advertising options. Product Dimensions: 145 mm x 15 mm x 10 mm. Printing Area: Upper Barrel: 30 mm W x 5 mm H. Lower Barrel: 40 mm W x 7 mm H. Clip: 35 mm W x 7 mm H. Colour Range(ex-stock): black, white, blue, red, grey, orange, green, yellow. Indenting: Standard Colours: MOQ 500 with any size of capacity. PMS Colour: MOQ 10k with any size of capacity. Decoration Methods: Pad Printing. Price includes : 7 days 1c/1p printed. Setup is not included, please ask for a final price from your sales representative.